Last April the Twin Cities got pounded with snow, but that's not very common. Welcome to April, where showers tend to lead to flowers but sometimes Minnesota gets hammered by more than a foot of snow. In today&apos;s Weather MN blog, brought to you by Pet Evolution, we&apos;re not talking about an epic April snowstorm like we had last year, but some flakes could lead to minimal accumulations in far southern Minnesota overnight Monday into Tuesday morning. According to the National Weather Service, temps will warm into the mid-to-upper 40s on Monday afternoon – much warmer than the 30s we had over the weekend – before the sun sets, the temps drop and a band of precipitation changes from rain to snow over southern Minnesota and northern Iowa. How much? Not more than and inch or two and more likely a dusting for most. The snow should stay south of the Twin Cities. Here&apos;s a look at the simulated future radar from one of NOAA&apos;s computer models (NAM 3KM), showing snow, possibly heavy at times, along the I-90 corridor overnight into Tuesday morning. 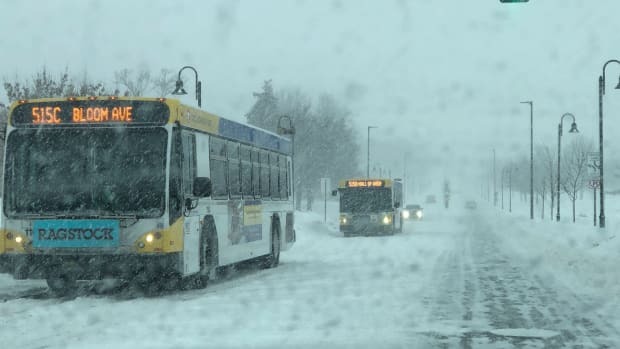 Last year, the Twin Cities got 7.5 inches of snow on April 3 and then got hammered with nearly 15 inches (20 in some metro areas) in the historic April 14-15 beast of a storm. Overall, 26.1 inches fell in April 2018 at MSP Airport. Here&apos;s how much snow has been recorded at the airport the past 10 Aprils. Clearly, April snowstorms aren&apos;t all that common around here, but we&apos;re talking about Mother Nature and she marches to the beat of her own drum. Bookmark the Weather MN blog. Temps this week should hover around 50 degrees for the most part before a warming trend arrives for the weekend with a potential of 70 degrees both Saturday and Sunday. No major storm systems look to impact Minnesota this week outside of another chance of rain Thursday, but that system looks more likely to cause impacts in Iowa. 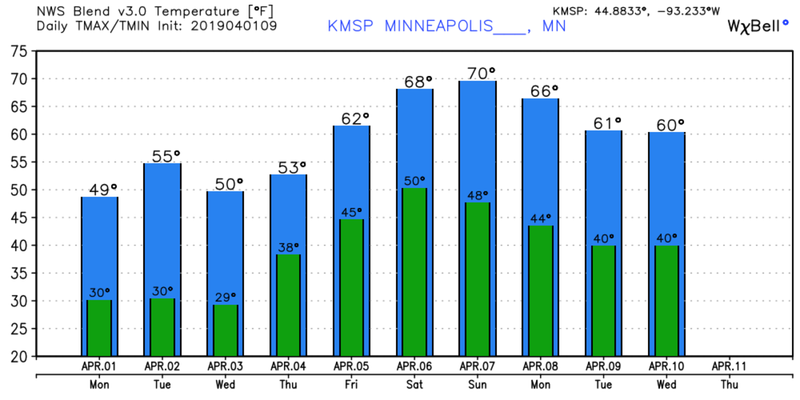 Longer term, the pattern looks like it could become more active late next weekend and beyond, and the Twin Cities office of the NWS has hinted at the possibility of some thunder in the not-so-distant future. Snow should arrive Friday during the afternoon and evening. Redwood Falls, Hutchinson and the Twin Cities are in line for the most. 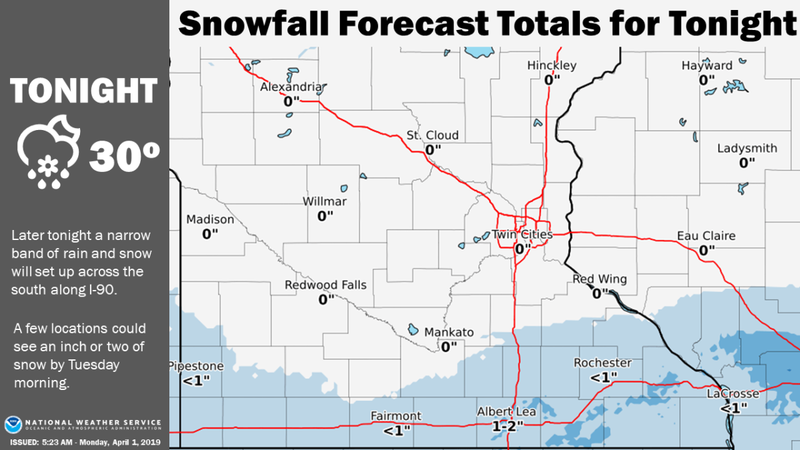 The Twin Cities is in line for some significant snowfall the next few days. The heaviest snow band is now just south of the Twin Cities.